Little smoked sausages are an excellent choice for this 3-ingredient recipe, but mini cocktail wieners or sliced hot dogs or smoked sausages also would be delicious. The secret to their deliciousness is the grape jelly sauce which is ridiculously easy to make. If you're familiar with grape jelly meatballs, you'll love these. They're a hit as an appetizer, on a brunch spread, for a potluck or tailgating and more. The sauce mixture is versatile and open to all kinds of variations. Keep the sauce simple or jazz it up with additional ingredients or seasonings. A splash of bourbon can add "spirit" or replace the chili sauce with a spicy ketchup or barbecue sauce. See the tips and variations below the instructions for a quick homemade chili sauce, some possible substitutions, and additional flavor ideas. Have toothpicks or forks, plates, and napkins on hand for your guests, and serve the little sausages hot right from the slow cooker. 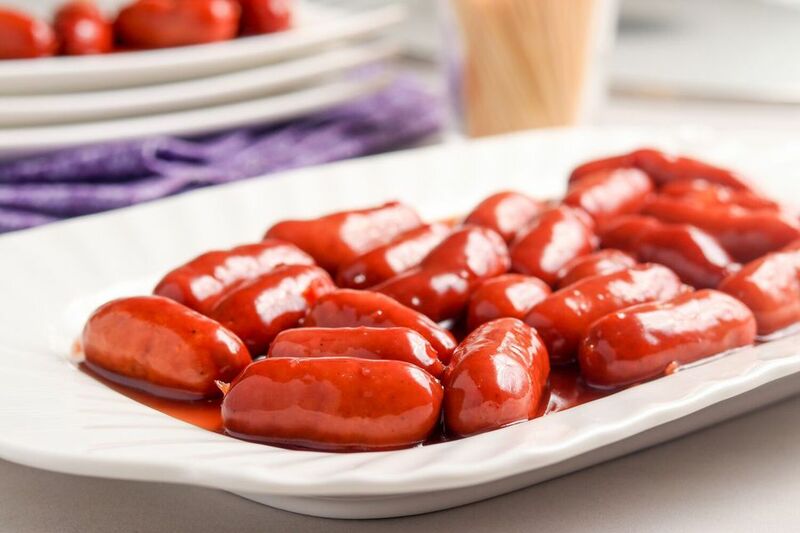 Combine mini smoked sausages or cocktail wieners in a slow cooker with chili sauce and grape jelly. Stir well. Cover and cook on LOW for 4 to 6 hours. Serve the little hot dogs or sausages from the slow cooker (set on LOW or WARM) with toothpicks, small plates, and napkins available for your guests. You might also spear them with toothpicks and arrange them on a plate drizzled with some of the sauce. Keep them warm on a warming tray or serve immediately. Chili sauce is a condiment that is similar to cocktail sauce (as opposed to Asian chili paste). Look for chili sauce near the ketchup in the supermarket. If you can't find chili sauce, you can make a suitable replacement from scratch. In a medium bowl, combine 1 cup tomato sauce, 1 tablespoon tomato paste, 2 to 3 tablespoons brown sugar, 2 tablespoons vinegar, 1/2 teaspoon chili powder, 1/4 teaspoon allspice, and 1/4 teaspoon onion powder. Blend well and store covered in the refrigerator. Instead of mini smoked sausages or mini wieners, use 2 pounds of Polish smoked sausage, andouille sausage, or similar smoked sausage. Slice the sausage into 1/2-inch or 1-inch pieces. Add 1 tablespoon of Worcestershire sauce to the sauce mixture. Replace the chili sauce with your favorite barbecue sauce. Add 1 or 2 cups of frozen pearl onions to the slow cooker with the mini sausages or cocktail wieners or add about 1 cup of sliced fresh onions. Replace the grape jelly with apricot preserves and 1/4 cup of packed light brown sugar. Replace the grape jelly with currant jelly or a can of cranberry sauce. Add about 1/2 teaspoon of cayenne pepper for a little "bite." For "spirited" little smokies, add a few tablespoons of bourbon to the sauce mixture. With this cookbook, you’re never more than a few steps away from a flavorful dinner. Get it free when you sign up for our newsletter.